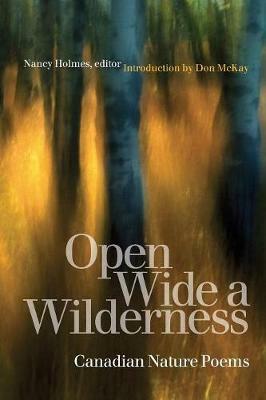 The first anthology to focus on the rich tradition of Canadian nature poetry in English, Open Wide a Wilderness is a survey of Canada's regions, poetries, histories, and peoples as these relate to the natural world. The poetic responses included here range from the heights of the sublime to detailed naturalist observation, from the perspectives of pioneers and those who work in the woods and on the sea to the dismayed witnesses of ecological destruction, from a sense of terror in confrontation with the natural world to expressions of amazement and delight at the beauty and strangeness of nature, our home. Arranged chronologically, the poems include excerpts from late-eighteenth-century colonial pioneer epics and selections from both well-known and more obscure nineteenth- and twentieth-century writers. A substantial section is devoted to contemporary writers who are working within and creating a new ecopoetic aesthetic in the early twenty-first century. Don McKay's introductory essay, "Great Flint Singing," explores in McKay's inimitable way the thorny issues of Canadian poets' representations of nature over the past 150 years. Focusing on key texts by Duncan Campbell Scott, Charles G.D. Roberts, Earle Birney, Dennis Lee, and others, the essay traces Wordsworthian influences in a New World context, celebrates Canadian poets' love of natural history observation, and finds a way through a rich and contradictory tradition to current trends in ecopoetics.